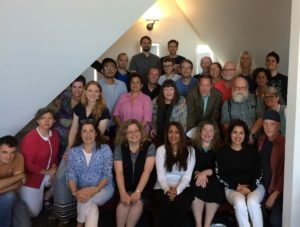 Professor James W. Laine hosted a National Endowment for the Humanities (NEH) Summer Institute for college and university teachers during the summer of 2017 on the theme of World Religions and World Religions Discourse: Challenges of Teaching the Religions of the World. The Institute will be a four week workshop on the problems of teaching a broad survey course intended to introduce students to the major religious traditions of the world, while taking into account major scholarly critiques of that enterprise that have raised fundamental questions about the basic definitions and categories we employ in the critical study of religion. Any views, findings, conclusions, or recommendations expressed in this program do not necessarily represent those of the National Endowment for the Humanities. Stipend: Individuals selected to participate in this four-week Institute will receive a stipend of $3,300. Stipends are taxable and intended to help cover the Institute’s expenses. The central question we will address in the Institute will be how one can responsibly teach a survey course on the religious traditions of the world. On the one hand, many students and the general public might emphasize the need for all citizens in a modern, multi-cultural world to have a certain broad literacy and basic understanding of the major traditions. On the other hand, critical scholars warn of the dangers of excessive essentialism, reducing a complex tradition to a few basic, doctrinal elements. Some wonder if the very category of ‘religion’ is inappropriate for traditions other than Christianity or perhaps the western monotheisms. Perhaps there is no genus (‘religion”) to which the various traditions (Hinduism, Buddhism, Islam) belong as species. Moreover, perhaps the internal diversity of any given tradition is at least as important as the differences between the traditions. How can we take the critiques of scholars like Masuzawa and McCutcheon and yet impart to students useful knowledge about the diversity of religious traditions of the world?